Rafael Nadal celebrates defeating Ivan Dodig in the Barcelona Open. Top-ranked Rafael Nadal looked more like his confident self on the clay in passing Ivan Dodig of Croatia 6-3, 6-3, to reach the Barcelona Open quarterfinals on Thursday. Nadal was struggling with his game coming into the event and an unconvincing opening victory on Wednesday did little to calm the nerves. But Nadal looked more assured as he ousted the 37th-ranked Dodig in 83 minutes in the third round. 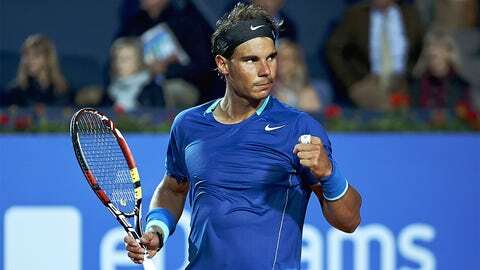 Nadal moves on to face fellow Spanish player Nicolas Almagro in an early rematch of last season’s final, which Nadal won for his eight title at the tournament in the Catalan capital. Almagro advanced after beating Fernando Verdasco 6-3, 6-3. Dodig’s attempts to come forward were met with passing shots from Nadal, who finally broke for 3-2 after coming to the net to force Dodig into netting a return. WHERE IN THE WORLD ... ? Where are your favorite players headed next? Check out our tennis season schedules. Dodig broke right back but Nadal had found his rhythm as he forced Dodig into 15 errors in the first set, when he won the last three games for the lead. Nadal maintained his play to start the second set, when he made fewer errors and seemed to grow in confidence to break Dodig for the fourth time as he sealed the win. "There’s still some work to do but I definitely took a step forward from yesterday. I move on feeling more assured," Nadal said. "I needed this game." Earlier, fourth-seeded Kei Nishikori beat Andrey Golubev of Kazakhstan 6-0, 6-4. Nishikori had been sidelined by a groin injury since beating Roger Federer four weeks ago. Russian player Teymuraz Gabashvili followed up his win over fifth-ranked David Ferrer with a 6-4, 6-2 victory over another Spaniard, Inigo Cervantes, to reach the quarterfinals. Ernests Gulbis of Latvia, Marin Cilic of Croatia, and Philipp Kohlschreiber of Germany all won to advance.